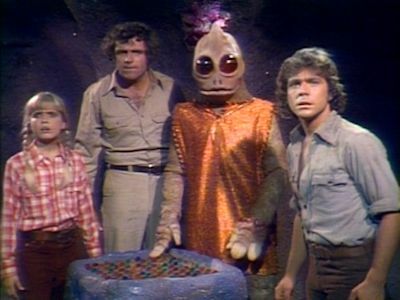 The MeTV Network is bringing Sid & Marty Krofft's popular series H.R. Pufnstuf and Land of the Lost to classic TV fans starting Friday, November 29 at 8|7c followed by a second special on Christmas Day, Wednesday, December 25. After the holidays, relive the magical mornings of the late '60s and early '70s each weekend. Both H.R. Pufnstuf and Land of the Lost will be added to MeTV's Saturday morning line-up beginning December 28 at 7am|6c. H.R. Pufnstuf kicks off the weekly line-up followed by Land of the Lost at 7:30am|630c. On November 29, the first two episodes of H.R. 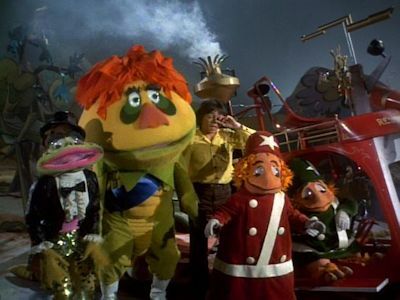 Pufnstuf will kick off the special from 8-9pm, followed by the first two episodes of Land of the Lost from 9-10pm. On Christmas morning the magic continues with the "Sid & Marty Krofft & Me" special which will air on Wednesday, December 25 beginning at 5am/4c. H.R. Pufnstuf and Land of the Lost, created in 1969 and 1974 respectively, are a pair of kids' television programs created by Sid and Marty Krofft. The duo's work is known for its vivid and colorful variety format and eclectic style. Meanwhile, the holiday season is here and at MeTV they're celebrating it by bringing us holiday episodes (both Thanksgiving and Christmas) from their lineup of classic programs. Daytime and nighttime, we'll be walking through a winter wonderland of festive favorites, starting this Sunday, November 24. Find out which holiday episodes are headed your way, and get ready to enjoy some of television's most memorable holiday moments. For the week of Nov. 25-29, 2013, we have many current sitcom stars and past sitcom stars on TV talk shows! All times listed are Eastern. So get your DVRs (or whatever you use) ready! Ready? Here is all what you need to know for the coming week! Demi Lovato (Sonny with a Chance) - Watch Demi on Jimmy Kimmel Live! at 11:35pm on ABC. Bette Midler (Bette) - Bette appears on The Tonight Show with Jay Leno at 11:35pm on NBC. Kelly Ripa (Hope & Faith) - Kelly visits Late Night with Jimmy Fallon at 12:37am on NBC. Giovanni Ribisi (Dads/My Two Dads) - Giovanni stops by Late Night with Jimmy Fallon at 12:37am on NBC. He will also be on Good Day New York on WNYW-Fox5 in New York between 7-9am. Katie Aselton (The League) - Katie is a guest on a repeat of Conan at 11pm on TBS. Jesse Tyler Ferguson (Modern Family/The Class) - Jesse appears on Rachael Ray, so check your local listings. Niecy Nash (The Soul Man/Reno 911!) - Niecy chats with the ladies of The View on ABC at 11am ET/10am CT-PT. Terry Crews (Brooklyn Nine-Nine/Are We There Yet?/Everybody Hates Chris) - Terry drops by The Talk on CBS at 2pm ET/1pm CT-PT. Whoopi Goldberg (Whoopi/Bagdad Cafe) - Whoopi is a guest on The Queen Latifah Show, so check your local listings. Tim Conway (McHale's Navy/Rango) - Tim appears on The Queen Latifah Show, so check your local listings. D.L. Hughley (The Hughleys) - D.L. is a guest on Tavis Smiley on PBS, but check listings for time. Rebel Wilson (Super Fun Night) - Rebel appears on a repeat of Conan at 11pm on TBS. Billy Crystal (Soap) - Billy visits LIVE! with Kelly and Michael, so check your listings. NeNe Leakes (The New Normal) - NeNe drops by LIVE! with Kelly and Michael, so check your listings. Niecy Nash (The Soul Man/Reno 911!) - Niecy is a guest on The Wendy Williams Show at 12am on BET or on your local stations. Tim Stack (Parker Lewis Can't Lose/Son of the Beach) - Tim stops by The Wendy Williams Show at 12am on BET or on your local stations. Kathy Griffin (Suddenly Susan) - Kathy Griffin and Rachael Ray are finding out how to look cute while eating all that holiday food…. by shopping for pig-out pants on Rachael Ray, so check your local listings. Danny DeVito (It's Always Sunny in Philadelphia/Taxi) - Danny appears on The Talk on CBS at 2pm ET/1pm CT-PT. Debby Ryan (Jessie/The Suite Life on Deck) - Debby talks about her starring role in Jessie on The Couch on WLNY 10/55 in New York between 7-9am. John Goodman (Roseanne) - Watch John on The Late Show with David Letterman at 11:35pm on CBS. Donald Faison (The Exes/Scrubs) - Donald appears on a repeat of Conan at 11pm on TBS. Bill Cosby (The Cosby Show/Cosby/The Bill Cosby Show) - Bill is a guest on a repeat of Comedy Central's The Daily Show with Jon Stewart at 11pm. Woody Harrelson (Cheers) - Woody visits LIVE! with Kelly and Michael, so check your listings. Sarah Silverman (The Sarah Silverman Program) - Sarah is a guest on LIVE! with Kelly and Michael, so check your listings. Craig T. Nelson (Coach) - Craig explains why Thanksgiving is his favorite holiday on Home & Family at 10am on Hallmark Channel. Alan Thicke (Growing Pains) - Alan chats on The Queen Latifah Show, so check your local listings. John O'Hurley (Seinfeld) - John will be on NBC's Today between 7-9am and possibly also the 10am hour. Kunal Nayyar (The Big Bang Theory) - Catch Kunal on a repeat of The Late Show with David Letterman at 11:35pm on CBS. Robin Williams (The Crazy Ones/Mork & Mindy) - Robin appears on a repeat of The Late Late Show with Craig Ferguson at 12:37am on CBS. Rashida Jones (Parks and Recreation/The Office) - Rashida visits Late Night with Jimmy Fallon at 12:37am on NBC. Ariana Grande (Sam & Cat/Victorious) - Ariana is a musical guest on Late Night with Jimmy Fallon at 12:37am on NBC. Whitney Cummings (Whitney) - Whitney is part of the guest panel on a repeat of Chelsea Lately on E! at 11pm. Julia Louis-Dreyfus (Veep/The New Adventures of Old Christine/Seinfeld) - Tune it to see Julia on a repeat of LIVE! with Kelly and Michael, so check your listings. Kym Whitley (Let's Stay Together/Animal Practice/The Parkers) - Kym is a guest on Bethenny, so check your local listings. Wendy Raquel Robinson (The Game/The Steve Harvey Show) - Wendy is part of the guest panel on Bethenny, so check your local listings. NeNe Leakes (The New Normal) - NeNe appears on a repeat of The Ellen DeGeneres Show, so check your local istings. Nolan Gould (Modern Family) - Nolan appears on a repeat of The Ellen DeGeneres Show, so check your local listings. Kelly Ripa (Hope & Faith) - Watch Kelly on a repeat of The Late Show with David Letterman at 11:35pm on CBS. Cobie Smulders (How I Met Your Mother) - Tune in to see Cobie on a repeat of The Late Show with David Letterman at 11:35pm on CBS. Tracy Morgan (30 Rock/The Tracy Morgan Show) - Tracy appears on a repeat of Jimmy Kimmel Live! at 11:35pm on ABC. Chris Pratt (Parks and Recreation) - Chris is a guest on a repeat of Jimmy Kimmel Live! at 11:35pm on ABC. Kat Dennings (2 Broke Girls) - Kat appears on a repeat of The Late Late Show with Craig Ferguson at 12:37am on CBS. Anthony Anderson (Guys with Kids/All About the Andersons) - Anthony stops by The Arsenio Hall Show, so check your local listings. Wendell Pierce (The Michael J. Fox Show/Cursed/The Weber Show) - Wendell chats with Tavis Smiley on PBS, but check listings for time. Whoopi Goldberg (Whoopi/Bagdad Cafe) - Whoopi visits The Wendy Williams Show at 12am on BET or on your local stations. Retta (Parks and Recreation) - Retta is part of the guest panel on Bethenny, so check your local listings. Mike O'Malley (Welcome to the Family/Yes, Dear) - Mike appears on a repeat of The Queen Latifah Show, so check your local listings.